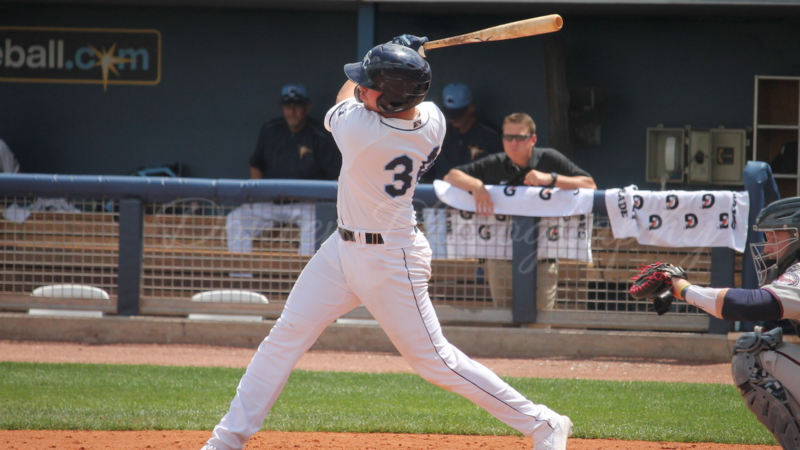 PORT CHARLOTTE, Fla. (April 9, 2019) - Taylor Walls delivered a three-run home run and Riley O'Brien struck out eight to lift the Charlotte Stone Crabs past the Bradenton Marauders 3-2 at Charlotte Sports Park Tuesday. O'Brien, the Stone Crabs (3-3) starting pitcher, allowed just one run on three hits over seven innings to earn his first win of the season. Bradenton (4-2) starter Domingo Robles (1-1) did not allow a hit through five innings. With the game scoreless in the top of the fifth, Oneil Cruz delivered an opposite field home run to give Bradenton a 1-0 lead. With the Stone Crabs down one in the bottom of the sixth, the Charlotte hitters found their stroke. Zac Law laid down a perfect bunt single before Russ Olive smacked a double to the wall in right. With two on and nobody out, Walls cranked a three-run dinger to left to give Charlotte a 3-1 lead. After Simon Rosenblum-Larson put up a zero in the eighth for the Stone Crabs, he walked the first two batters in the ninth to put the tying run on. Chandler Raiden entered for Charlotte and got Cal Mitchell to fly out, but the runners advanced to second and third. Olive then made a diving stop on a Cruz ground ball to record the second out, as a run scored to make it 3-2. With the tying run at third, Raiden got Lucas Tancas to strike out and end the game. The Stone Crabs have begun the season 3-1 at home and are now 2-1 in one-run games. Charlotte will send Tommy Romero (0-0, 2.08) to the mound at 10:30 a.m. on Wednesday morning in Bradenton. Aaron Shortridge (1-0, 0.00) will pitch for the Marauders. Coverage begins at 10:15 a.m. on the Stone Crabs Baseball Network.